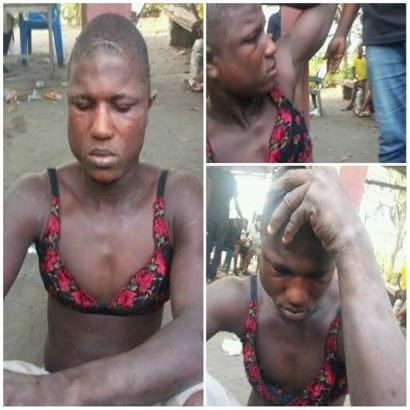 A man desperate to make money has met his nemesis after he was caught trying to steal bra for money ritual. A Nigerian man has been humiliated and beaten mercilessly after he was apprehended wearing bra on Friday night while on an alleged mission to steal underwear in Delta State that he would use for money ritual. It was gathered that the suspect was reportedly caught by local vigilante in Agbarha area of the state after he had allegedly stolen a bra and was looking for underwear to steal to complete his mission. When he was quizzed by the security operatives, the suspect allegedly confessed that a man whom he asked to show him the way to make money told him to go and find where to hustle underwear and bra before he helps him. He was caught by vigilante members after stealing only one bra.